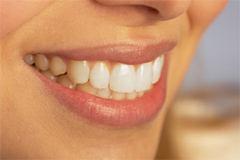 WHITENING - This is the procedure of making teeth whiter, and therefore more attractive. Our office uses tray whitening. The cost of the tray method is about half compared to Zoom!, and there is usually less post-treatment sensitivity. That's right! The team at Pieri Family Dental is now proud to offer Invisalign - the clear alternative to metal braces. If you have been wondering about Invisalign and whether or not it may be the right fit for you, we welcome you to schedule an appointment with our team. Your consultation is FREE!